As always for the brand, 2015 Sage Hit Football offers a moderately priced option for collectors looking for some of the first cards and autographs of upcoming prospects. 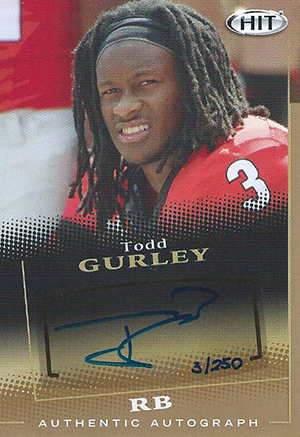 Low Series boxes have ten autographs from players headed to the 2015 NFL Draft. This jumps to 12 autographs per High Series box. Both Low Series and High Series have different cards, similar to a product with separate Series 1 and Series 2 releases. The base set has 150 cards, 75 each for Low Series and High Series. Besides basic player cards, there are a pair of subsets called Next Level and Spotlight. Jameis Winston also has a five-card Five Star subset at the end of the High Series checklist. Players in the base set plus a few more also have basic Autographs that are numbered to 250 or less. Jameis Winston, Amari Cooper and Todd Gurley are among those signing for 2015 Sage Hit Football. It is worth noting that Marcus Mariota is not in the product. Write Stuff inserts return for another year, landing two per hobby box. Autographed versions come numbered to 25. Also available are Artistry Autographs (#/100 or less). All autographs in 2015 Sage Hit Football are included in boxes. There are no redemptions. #66-90 Next Level (NL) subset. 1 card. Inserted in High Series boxes. 12 cards. Inserted two per box. Very flimsy and cheap cardboard set/cards. If you harken back to the days packs of cards were .25/pack then this is for you. To pay what you pay to get a pack of 4 cards cheaply made then go for it. Otherwise don’t waste your money. What does a blaster/retail box go for in store? I noticed that people are selling blaster boxes on eBay for $40. That’s double than what they were last year, so are the people on ebay overpricing them, or did they jump in price? i just never learn. opened 10 boxes, most from Walmart in KC were i live , a few from FL while on vacation. I am still 3 cards short of making low series set. !! R U Kidding ?? 8, 17, & 61 if anybody wants to trade for an artistry set. i have 3 of those. Finally found some boxes and purchased 2. I’m glad that they greatly reduced the number of cards per box so that I didn’t have 5+ of the same cards after two boxes. Also, four autographs per blaster box is a great bonus. The autographs looks very nice and still have a modern feel and look to them. However, the base cards have an “old school” feel and look. Personally I don’t like cards like that, but to each his own. I am glad that they added a subset that’s nice looking for base set builders like me. Overall, I like the number of cards and the autographs, but I really do not like the cheap cardboard cards. The card designs aren’t bad, I’m just not a big fan of it. VERY pleased. Got 3 semi decent autos and a Jameis Winston five star /50 auto in my first box ! The cards aren’t bad, like people said before the cardboard is flimsy and cheap. My issue with these sets is that it takes 7-10 boxes ($20 boxes) if your lucky to make a complete set, compared to 3 2015 Leaf boxes I bought and got 2 full sets. I’m only missing one card in the high series (54), I think its ridiculous that Ill have to spend $20 to hopefully get one card, and end up with a million doubles and triples. 1star the 4 autographed cards box has a duplicate and their cards are like cardboard I recommend not buying them. About the worst I have seen. The cards look like they were printed on a paper grocery bag. Not nearly worth the cost.